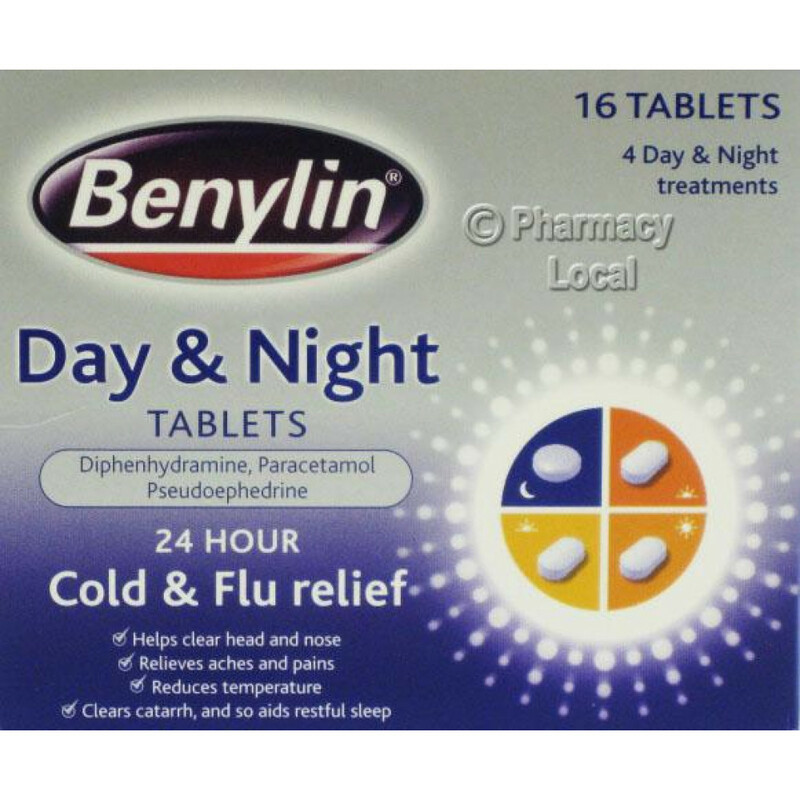 Benylin Day & Night tablets are multi-action tablets that are effective in clearing head and nose, relieving pains and aches and symptoms of common cold and flu, reducing temperature, enhancing sleep by clearing catarrh. 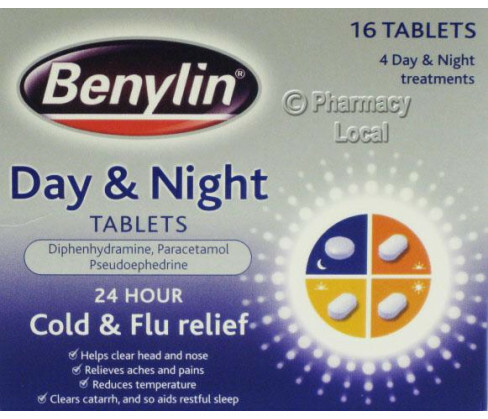 Benylin Day & Night Tablets Pack contains some white daytime tablets and some blue night tablets. The daytime white tablets are composed of Paracetamol, an antipyretic and analgesic for relieving fever and pain. The other active ingredient is a decongestant called Pseudoephedrine Hydrochloride that unblocks stuffy noses. The night blue tablets have active elements such as Paracetamol and an antihistamine called Diphenhydramine Hydrochloride that assists in clearing catarrh and making you get a restful and rejuvenating sleep. Remember never to exceed stated dosage. Avoid if you are sensitive to Paracetamol products or any other constituents. Keep them safely away from children?s reach. Exercise caution while taking night tablets as they may trigger drowsiness. Avoid if breast feeding or pregnant. Avoid giving to children below 12 years of age. Avoid if you have severe heart disease or high blood pressure. Avoid if you are already having another medicine containing a decongestant or Paracetamol. Avoid if you are on or had been taking anti-depression drugs in the past two weeks. Children below 12 years and adults must take 4 to 6(1 daytime tab in the morning, then one tab at mid-day and then one tab in the afternoon). One night tablet at bedtime. Each of the four Night Blue-coloured tablets contain Paracetamol 500mg, and Diphenhydramine Hydrochloride 25mg, while each of the twelve Day White-coloured tablets contain Paracetamol 500mg, and Pseudoephedrine Hydrochloride 60mg.